Cultural Imperialism Triggers Global Protests Against U.S. 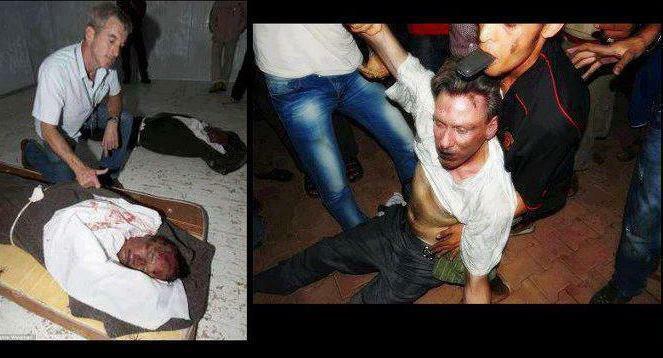 US Ambassador to Libya Christopher Stevens gives thumbs up over the body of Qaddafi (left); corrected by Libyan crowd (right). The first protest that got the world’s attention was in Libya, where U.$.-backed forces recently overthrew the decades-old government there. Timed to occur on the anniversary of the 11 September 2001 attacks on the United $tates by Al Qaeda, rebels grabbed headlines by laying siege to the embassy, killing as many as a dozen people, including the new U.$. ambassador. Since then protestors have attacked imperialist embassies in Tunisia, Yemen and Sudan without firearms. While incumbent U.$. President Barack Obama has been making plenty of mention of his role in the assassination of Al-Qaeda’s former leader Osama bin Laden in campaign speeches, hundreds of protestors in Kuwait chanted outside the U.$. embassy, “Obama, we are all Osama.” Osama’s vision of a Pan-Islamic resistance to U.$. occupations and economic interference in the Muslim world has reached new heights this week. The Amerikan media has tried to play it off as a small group of trouble makers protesting, while Amerikans are shocked that they can be blamed for a fringe movie they have never seen and think is a piece of crap. At the same time, Amerikans seem very willing to condemn the protestors as ignorant, violent, low-lifes — just as the movie in question portrayed Muslims. But the trigger of these protests is far less important than the history of U.$. relations to the people involved. The most violent reactions occurred in countries that have all been under recent bombing attacks by the U.$. military, two of them for many years now, and the other had their whole government overthrown. Cocky Amerikans won’t recognize that the ambassador was targeted as the highest level representative of the U.$. puppet master in Libya. MIM has held for some time that Muslim organizations have done more to fight imperialism in recent years in most of the world than communists have. (2) And while there are plenty of ways communists could theoretically be doing a better job, they are not. As materialists we must accept and work with the people and conditions we are given. And we do not hesitate to recognize that Islam has brought us the biggest internationalist demonstration of anti-imperialism we’ve seen in some time. 2. Osama Bin Laden and the Concept of “Theocratic Fascism”, 2004 MIM Congress.